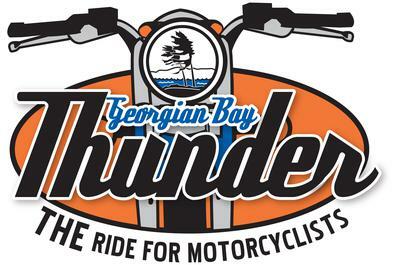 Your support as a rider in the 6th Annual Georgian Bay Thunder Motorcycle Ride fosters volunteerism, community involvement, and youth engagement. It ensures that individuals, families and seniors who are homeless or at risk of homelessness and those with no other means of transportation receive the services they need. The fee for the ride is $30 for Rider Poker Hand - $10 for Passenger Poker Hand. A $25 charitable receipt is available Riders are also welcome to collect pledges. Any rider who collects $100 or more in pledges will ride for FREE! To register or print off a pledge form please visit our website. Your fee includes: * Ride Entry * Prizes * Coffee, Water, Snacks at start * Free Park Pass for Bike Week 2014 (includes all activities July 11-20, 2014 with the exception of camping, bike tours and bike games) Georgian Bay Thunder is the charity fundraising ride during South Georgian Bay Bike Week 2014.